We made it! A week late, but still here. Sickness while trying to keep all the various plates I have in the air AND not go completely mad is near impossible. So as not to slip all the way into the crazy-pond, I gave myself permission to rest a bit this week. I hope ya’all can forgive the delay. 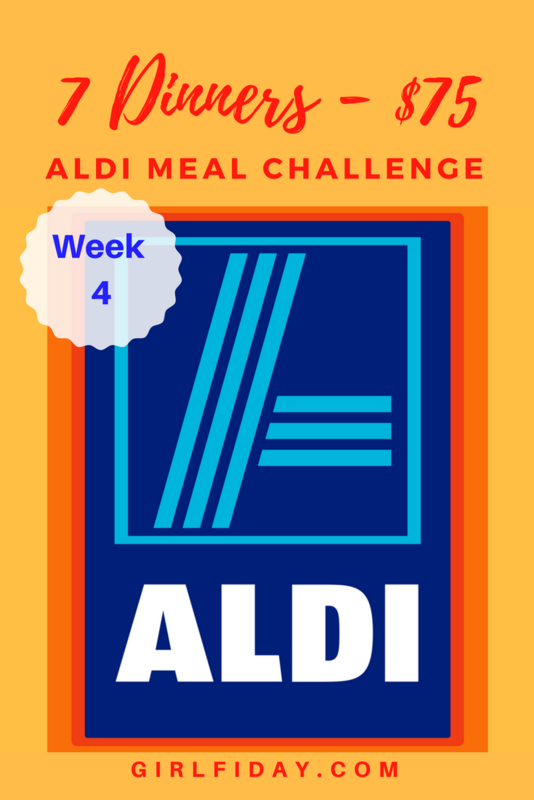 So, here we are at week four of our ALDI Meal Challenge, and honestly, what started as an experiment, has helped us develop a very good strategy for meal planning while saving both money and time each week. It also forced my daughter and I to sit down, take inventory of what we had and create a good variety of meal options around that. I would have been happy to simply see a savings in our grocery bill – but to also reduce waste, eat better, save time and ensure my whole family came together at the table every night, are benefits that compound in value exponentially. What was also really cool is that I did this with my 22-year old daughter. She lives with us, as she has just finished an esthetics program and is getting ready to get back to work full-time. In the meantime, as a trade-off and to contribute to the household she has basically taken over most of the meal preparation in this house. With is SUPER AWESOME for me as I am balancing two businesses, mom-in-chief of Team Mays, this blog and trying to get another passion project off the ground. It allows us time to bond when we sit down and meal plan together, make the grocery list and shop with one another. She helps me take pictures of most of the meals and also helps me write down each of the recipes. So, I really do need to give her a HUGE amount of credit for seeing this challenge all the way through. Momma thanks you bunches – Baby Girl! So here is our final meal plan… Madison did not disappoint this week. I have a favorite! The stuffed shells. 100% Vegan and, honestly, I don’t think there was a dirty plate left – they had all been licked clean (figuratively – not literally. Well, not literally for most of us. I cannot vouch for all of the Littles). Meal 2: Battered Fish Tacos on corn Tortilla, Shredded Cabbage, Limes, Chipotle Lime-sauce, with beans, rice and fresh salsa. I’ve said this before, but in case you are new here…I am not a chef or a foodie. I don’t have ANY aspirations of becoming a food blogger. I am just a working mom, trying to manage my menagerie. When I want to make a dish I usually search the internet for a recipe to base most of my ingredients on and then make adjustments depending on what I have or what I think would taste better. I have tried to provide as many recipes as I can – because I know not everyone is as comfortable in the kitchen as others. Even so, please bear in mind that most of the time I am just winging it here and the meal suggestions I have – are mostly just that – suggestions, a guideline for your to create your own meal plan and to do so on a budget. Cube potatoes and boil in water until they are almost cooked through. Strain and set aside. Cook your “nacho cheese” and “meat” and set aside. Once potatoes are strained and mostly dry, put at the bottom of a casserole dish. Add seasonings to your liking. Next pour “nacho cheese” over the potatoes. Then layer the pre-heated and thinned refried beans on top. (You can heat the beans up in the microwave and then add a bit of veggie stock and mix to thin them out) Next, layer the cooked “meat”. On top of the meat, add corn and chili beans. Next, sprinkle with cheese and, lastly, top with sliced olives. Pop in the oven at 400 degrees for 20 minuets and serve. Melt “butter” in a non-stick pan on medium heat. Once melted add in all ingredients EXCEPT veggie stock and whisk together. (It will be clumpy) then turn your stove to low heat and mix in the veggie stock, continue stirring with whisk, until nice and smooth. Serve asap. Stuff with meat (meat alternative), sauce, and cheese (cheese alternatives) of your choice. You can put just about any filling you like in these. Ground beef, turkey, shredded beef, pork, even fruits for a yummy dessert. They are a fun treat and changed up our Pizza Friday! Not quite gumbo and not quite jumbalaya….but as tasty and best served over a heaping spoonful of white Basmati or Jasmine rice. Cook your rice. (We use a rice cooker) Once your rice is cooked add the juice of three limes, mix and set aside. An hour before you are ready to serve, add in the crab. Then heat 2 TBS of butter on medium heat and put scallops in the pan flat side down. Let them cook for about 2 minuets and flip. If you like you can season them with paprika and salt and pepper. Once scallops are MOSTLY cooked add them (excess butter and all) into the crock pot. Stir and cover. Next do the same with your shrimp but DO NOT cook them all the way. Only cook them until they are about half way cooked all the way through. Sprinkle the flour and (and optional seasoning) into the shrimp and mix well so that the shrimp is coated. Once the shrimp is half way cooked, add to the crock pot. Let it sit for another 30 minutes and then it is ready to serve. The flour coated shrimp will help thicken the stew. Serve over fragrant rice. I truly hope you have enjoyed both the shopping challenge and the meal options we have suggested. Feeding a family on a budget can sometimes be frustrating and can get out of control. What I hope we have shown is that, if you are a bit more intentional about both your shopping, and meal planning/prepping – you can make significant room in your budget – without sacrificing the joy that a good cooked meal can bring! Hi Wendy, I heard about your Aldi challenge during my binge listen of your podcast over the weekend. There is an Aldi in my town but there is a new one going up less than 2 miles from me. We are a family of four and I eat entirely plant based. I printed some of your recipes and will try your challenge here really soon! Awesome! I had NEVER heard of an ALDI before becoming part of the FI community. I was SO excited to learn they had just opened up a store near us when I first did these posts. Such a great store with great prices. 3rd Quarter Update – Our Net Worth Decreased and Why That's OK!